Our recent Krabi trip was very enjoyable, filled to the brim with activities and we wished we could’ve stayed for longer! So many islands to visit! So much food to try! So many things to do! With only four days to spare (2 ½ days if you minus the travel times), it’s a case of too much to do, so little time. On the first day arriving there, we were kinda tired from the long drive. But seeing the tall limestone hills, the green and the crystal blue sea made the drive so worth it. As we arrived at our resort, we were welcomed by somebody wearing scarf! Sunda resort is a muslim-owned resort, which I googled after hearing about muslim resorts in Krabi. There are a few actually, but the sparkling reviews of Sunda Resort on Trip Advisor made this the winning choice. 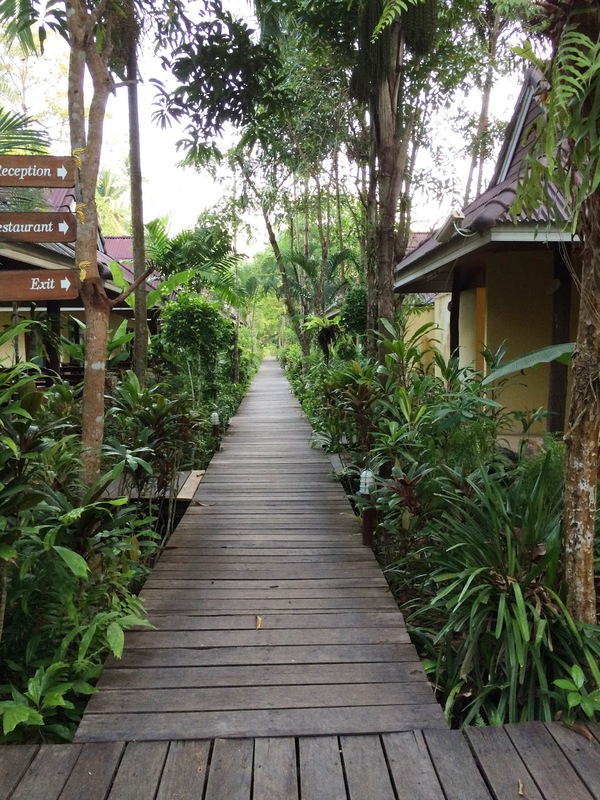 The walk towards our room is surrounded by lush greenery. Why a muslim resort? First is the convenience of halal breakfast, and also the feeling of being home listening to the 5 times azan. They aren’t intrusive or loud, but more like a background sound, very soothing. We decided not to drive in Krabi. To be honest, in the beginning we were a bit put off by how far the resort is to the beach. It could easily be 2-3km to Noppharat Thara beach and more so to Ao Nang Beach. But they told us there’s a complimentary van to and from both beaches, so that’s settled! 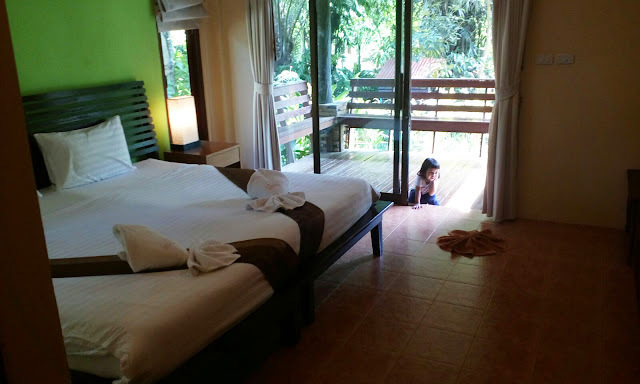 The rooms are generously big, overlooking the canal and little jungle as we call it. 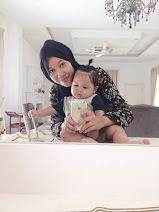 There’s a small sitting area at the back where I like to spend the mornings before both hubs and Naila woke up. The bathroom is also huge, with an open roof so you can hear crickets at night while showering. The bed is big enough for the three of us. We love our resort and will not hesitate to come back here again! One the best things about being a muslim in Krabi is that you’re actually spoilt for choice of food. What a refreshing change compared to other retreats outside of Malaysia. 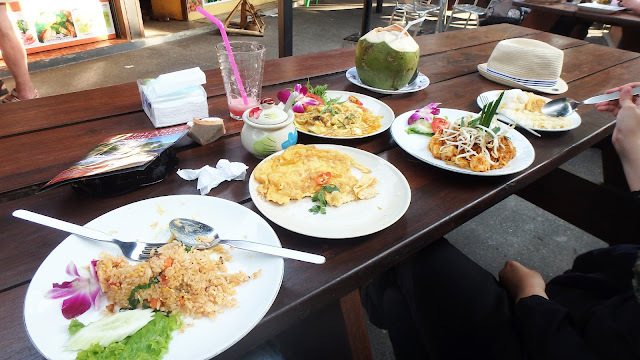 Before going to Krabi, I surveyed the internet for Halal good food in Krabi and people mentioned the area in front of the Ao Nang mosque is a good place to look for halal food. Truth is, you can find food anywhere you are in Krabi. The streets are lined with food vendors, restaurants, shacks—you name it, they have it. If you want to have a nice dinner at an upscale place, you can try the restaurants at the big name hotels, they’re mostly halal. Another thing about Krabi is that, you can choose a stall at the side of the road and their food would be so good! The choice of delicious food is plenty. One food stall I’d like to mention that became our favorite is May & Zin. Hubs dubbed their Siakap sweet & sour as 5 stars and I agree! A Trip Advisor favorite, and we decided to try it! 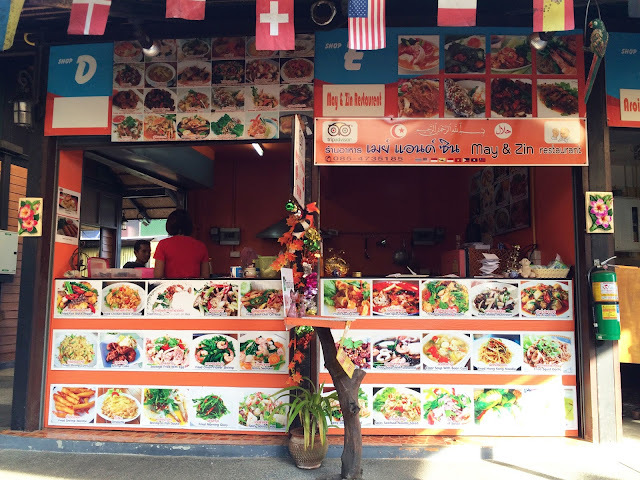 We also tried the Malaysian favorite Bamboo restaurant, and sidewalk stalls selling the famous Krabi pancakes in a variety of flavors! Krabi is not an island. Yup, it’s actually a peninsular reachable by road transport. That explains how we got there by car. But, Krabi is surrounded by numerous islands, too many to count. Activities mostly covers water sports, there’s elephant riding, hiking, rock climbing, horse riding, island hopping and sight-seeing. A few operators organize ‘sunset cruises’ whereby they take you around the vicinity of Krabi’s islands, go snorkeling, cliff jumping, then you’ll be served with dinner while watching the sunset. If you ask me, there’s so much to do. With only 4 days to spare, we cannot possibly cover everything we wanted to do, plus the activities we choose had to be suitable for Naila who’s only 2. So we did kayaking in Ao Tha Lane (6KM in 2 hours! ), and spent the day relaxing in one of the most beautiful beaches in Krabi which is Railay Beach. Hubs also snuck in a scuba diving trip at Koh Phi Phi. Seriously, I WISH I had 10 days in Krabi at least. That’s not even counting the bigger islands people were talking about like Koh Phi Phi and Koh Lanta. Like I said, we had to pick and choose the most suitable things for Naila and for that amount of time. It was sooo hard!!!! I was very surprised at seeing how many families there are in Krabi. I had a feeling that we’d be the only one toting a toddler but boy I was wrong! I didn’t bring a stroller (the horror) because of how wrongfully I judged Krabi before going. For the record, the sidewalks were so smooth and generous, perfect for strolling around Ao Nang or any other beaches. I even saw strollers on the beach! Babies were everywhere! I love it. The place felt relatively safe, the people were polite; it made the trip so much easier and comfortable. So comfortable that, on the third day, I took Naila to Railay beach on my own by long tail boat! I’ll talk about our activities in Krabi in a next post.